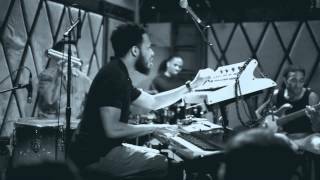 Cory Henry is a multi-instrumentalist and producer with a catalog worthy of a man twice his age. His primary instrument is the organ, and he began playing at the age of two. At the age of six he competed at the Apollo Theater and made it to the finalist round. In 2010, he co-produced Jay White's "Larger than Life". Later that year he released his first album "Christmas With You", which featured his lively renditions of Christmas classics and prominently showcased his skill as an improviser. Kim Burrell's Grammy nominated and Stellar Award winning "Love" album released in 2011 boasted several tracks that were written and produced by Henry. Later on that year, he released a single entitled "Leave Me Alone" featuring his vocal artistry. At the tender age of nineteen he had the opportunity to begin traveling with the Jazz legend Kenny Garrett as his organist in a stint that lasted three years. He has done television work playing on the third season of Sunday's Best for BET and on the Jimmy Fallon Show. He has worked with Aretha Franklin, Yolanda Adams, Sara Bareilles, Stanley Brown, Ray Chew And The Crew, P. Diddy, Kirk Franklin, Rob Glasper, Ron Grant, Lalah Hathway, Derrick Hodge, Israel Houghton, Joe, Shaun Kingston, Donald Lawrence, Mary Mary, Donnie McClurkin, Michael McDonald, Boyz 2 Men, NAS, Snarky Puppy, Tommy Sims, Bruce Springsteen, The Roots, Hezekiah Walker, Bishop Jeffrey White, the late Timothy Wright, and many others. Henry's awe-inspiring impromptu YouTube performances have gained him a loyal and sizable following. His first album, "First Steps" was released in the July 2014 and was celebrated on iTunes as "New and Noteworthy" and debuted #1 on the iTunes charts. He is currently touring with Snarky Puppy, his own band "The Funk Apostles" and lending his talent to the production of several projects for other artists. "I think this record is a more soulful, touching piece than it is anything else. It's a project from my heart." 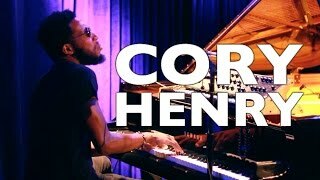 You might know Cory Henry as an in-demand, multi-instrumentalist and producer who's worked with an array of musical legends across genres, including Yolanda Adams, Sara Bareilles, P. Diddy, Kirk Franklin, Kenny Garrett, Robert Glasper, Derrick Hodge, Shaun Kingston, Donald Lawrence, Michael McDonald, Boyz II Men, NAS, Bruce Springsteen, The Roots and as a member of the Grammy Award-winning collective Snarky Puppy. But The Revival is truly Henry's story, a live album and DVD showcasing Henry's deep musical roots, both in the church and outside of it. Filmed and recorded in Brooklyn at the Greater Temple of Praise, The Revival showcases Henry's musical roots in gospel, jazz and soul. Working off his instrument of choice — the Hammond B-3 organ — the musician is joined by drummer James Williams and his godfather, Bishop Jeffrey White, who delivers a stunning vocal take on "Old Rugged Cross." On this special night, the Brooklyn native's improvisation was on full display: at times playful, soulful and powerful, nodding to musical influences (jazz, gospel, R&B) but greatly expanding on the sound. "For me, it was playing my favorite instrument in my musical garden," he says. "I just wanted to use my upbringing and the music in my heart and bring it to my listeners." While not having much "formal" training, Henry started playing the Hammond at the age of two. By six he was competing at the Apollo Theater, where he made it to a finalist round. Honing a discipline found while performing in church, Henry eventually branched out from the gospel and spirituals of his very early days to find a range of non-secular influences and playing styles. The documentary "Gotcha Now" delves into Henry's story, watch Part 1 and Part 2 here and here. "The Hammond organ doesn't get enough credit in today's musical society," he says. "It's my favorite instrument, my first love. It's mainly used in church, but I wanted to show it's not just something for the church." Although the setlist on The Revival draws from a well-known canon (from old gospels to Stevie Wonder), Henry stretches and pulls, driving the songs into unfamiliar territory and coming up with altogether new takes. There's an almost frenzy to "That's Why I'm Happy" and "I Want to Be Ready," while other songs move the crowd to, well, happier places. "I did 'If You're Happy and You Know It' because it's fun," says Henry, who gets his fans into a full singalong. "And it's interesting how it works, because it comes right before the devotional tune 'That's Why I'm Happy.'" The good news is that you'll get to experience The Revival in person this year. Besides his on-going work with Snarky Puppy, his studio roles and headlining stints with his own band The Funk Apostles, Henry plans to bring his musical gospel on the road. It won't necessarily sound the same as the record. "I play these songs pretty often, but I turn on to different aspects — it can be different from night to night," he says. "It's like my version of Art Tatum: he has many records with similar songs, but each record is different. He improvs them differently. I'm taking that approach." As for the record: "It really speaks to who I am: a musician who came up through the church world, then grew up and had all these new experiences. I'm hoping we can listen to these songs with different ears and a different mindset." Henry, a Best R&B Grammy-winner with Snarky Puppy (and once again a winner with SP for the Best Contemporary Instrumental Album Grammy for the 2015 album Sylva), will also release a second album later this year, this one with The Funk Apostles. Whereas The Revival is a tribute to his first love, the Hammond organ, and a showcase for his exceptional talents on the instrument, the coming album with The Funk Apostles will feature a full band sound – forged by nearly 100 shows over the last year. It is a synthesis of Henry's many influences – Michael Jackson, Marvin Gaye, Prince, Herbie Hancock, Jimi Hendrix, Stevie Wonder, James Brown. Henry will be taking a classic sound into the here and now. As Henry says, "my way, my take." "This project is a special one for me, as it features songs that I grew up on from church as well as two songs that I wrote. I thought I would give it a shot, and therefore decided to do a solo record like piano players of the past. But in doing that, I wanted to find a way to be innovative and present a new sound and present the organ in the different light. I feel that the Hammond organ doesn't get its justice in pop music and mainstream music. The legends of the instrument like Jimmy Smith, Joey D Francesco, and Billy Preston have brought the sound a long way. I really believe that this organ project is going to be informative and innovative. Unlike any other solo project ever heard. 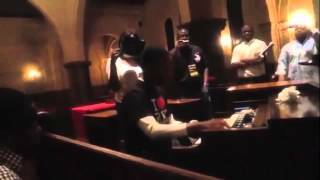 Every sound you hear is from a real hammond B3 . I recorded this record all in one night and all one takes. Mistakes and all this project is authentically me. This record is not for just musicians but it gives everyone something listen to whether they’re cleaning their house, driving to work, are on the way to a jazz club, or even to church on Sunday morning. My hope is that this record will inspire people to think outside of the box and to perfect their craft so that they can share their gift with the world." 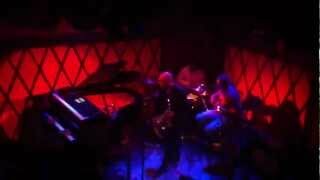 Cory Henry Quartet plays "Giant Steps"